Answering the age-old question: if a killer tree stalks the woods and no one is around for it to murder, does it make a noise? 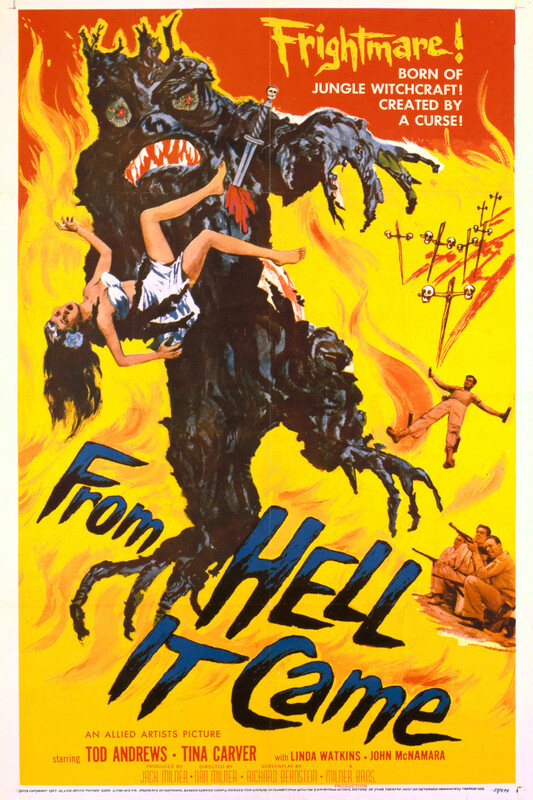 This has already been an incredible year for B-movies on home video, and now Warner Archive has delivered yet another fifties camp classic with 1957's From Hell It Came. What do you give the genre enthusiast who has it all? I suggest you get them a pristine Blu-ray containing this, one of only two movies from Milner Brothers Productions (the other was 1955's The Phantom from 10,000 Leagues). For fans of a certain kind of movie, this schlock-fest offers quite a bit: a lush Polynesian setting complete with hula girls, a killer tree, deceit and murder, a killer tree, a vicious cat fight between two islander women, dated portrayals of Pacific Islanders by Caucasians, a killer tree, deadly quicksand, a cool theremin soundtrack, and a killer tree. There's a lot to criticize, but it's all so goofy that it's hard not to just enjoy yourself. Convicted to death for a murder he didn't commit, Maku (Chester Hayes) vows that he will return from hell to dish out revenge for his betrayal. His tribal chief and the chief's mistress aren't too worried about the death of an innocent man UNTIL Maku does indeed return from the dead in the form of The Tobonga, a spirit that inhabits the form of a tree stump. 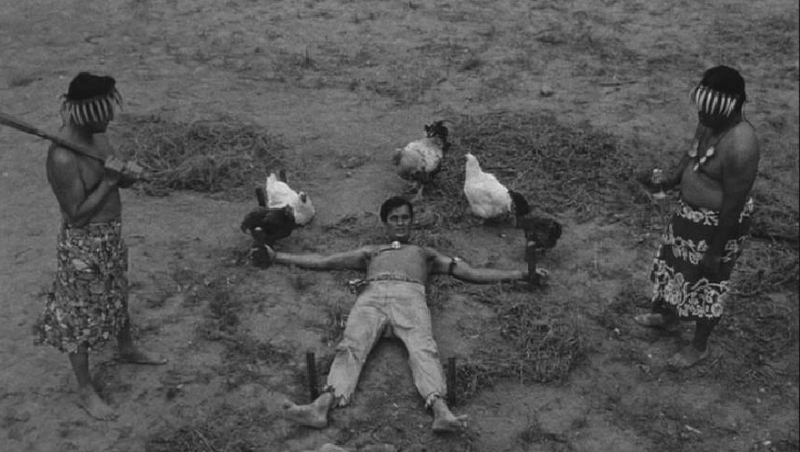 Nearby, a group of American doctors are conducting research and trying to eradicate disease on the island when they find themselves caught in the path between The Tobonga and his victims. The acting across the board is bad. You can tell that the actors are struggling to remember their lines, often stumbling mid-sentence before recovering. Also, a choice was made to make one of the women (Linda Watkins) at the doctor's camp English, complete with a terrible Cockney accent that comes and goes and turns into other accents throughout the movie. Character actor Tod Andrews (The Gray Ghost) is our male lead here, while his love interest is played by Tina Carver, an actress I don't think I've ever seen in anything else but who kind of gives off the vibe of a 1950s Scarlett Johansson. None of these people really matter all that much, and you're not all that upset when Tobonga starts to pick people off. To quote something that someone from Greenpeace probably said at some point in history, we're here for the tree, man. Luckily, the tree does NOT disappoint. I mean, it might disappoint a viewer who has only ever seen sentient trees in The Lord of the Rings: The Two Towers, but for fifties fans, this is an outstanding effect. The costume itself was made by Don Post Studios, the legendary mask maker who created the William Shatner mask that was modified for Michael Myers in the first Halloween film. Some have dubbed Don Post "The Godfather of Halloween," and it's easy to see why. His practical suit for The Tobonga (not to be confused with The Topanga from Boy Meets World) is actually very impressive, especially given the era of film-making in which From Hell It Came was born. The suit, which I assume is some form of rubber, has a beating heart and a slightly-articulated face, meaning it can raise it's "eyebrows" should the suit itself be required to emote or look dubious. This bulky suit, with its limited range of movement, might actually be better than some of the human actors in this movie. 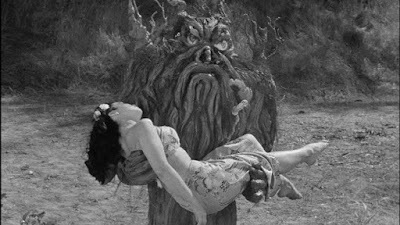 In the world of low budget film, especially from the 1950s, this is one of the better monster suits that I've seen. 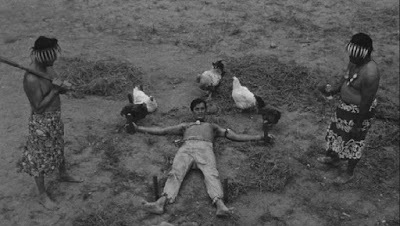 From Hell It Came is a breezy little movie that was part of a double feature with The Disembodied when it was released in 1957. It's probably a very politically incorrect movie, but placed in the context of the fifties, there's nothing unforgivable here other than the actors and their inability to deliver their lines. All in all, the film reminds me of the segment from Creepshow 2 where the wooden Cigar Store Indian comes to life and kills, which is my favorite from any Creepshow movie. Apparently I have a thing for racially-charged sentient wooden totems. That's okay. I'm super-stoked to have this quirky little gem on my shelf next to the other great Warner Archive genre releases from the last few months. Low budget horror buffs and mid-century kitsch fanatics (I'm both) will be very happy to have this. You can buy the From Hell It Came HERE.